*As I’ve explored this book and written this post, I noticed that this post has the appearance of a summary, which is not the intention. I’ve noted pages of the book to get a deeper understanding of the author’s message and in particular online spaces to go in order to see his detailed (and useful) examples. I encourage teachers keen to “dive” into inquiry more deeply to purchase the book and look at the many, many, many authentic examples provided by the author. Trevor MacKenzie brings teachers a straightforward, well structured book that offers strategies to bring inquiry based learning to your classroom. It’s a no-nonsense guide that doesn’t pretend that teachers and students aren’t challenged to create authentic, personal learning in schools. MacKenzie is a teacher writing for teachers, and is sharing a fundamental core of his own teaching practice, littering the book with wonderful real-life examples to support his ideas. (have a QR code reader app on your device to access some of the samples) The author also recognizes that we all have curriculum expectations we need to cover, and that knowledge that must be attained. How do we create this environment and meet expectations? This book gives us a powerful example. MacKenzie gives explanations of inquiry and inquiry based learning, discusses his “three big goals”, and gets into the model for the year. He explains the Types of Student Inquiry: Structured, Controlled, Guided, and Free Inquiry. He also discusses the Understanding by Design framework. I like the creative quality of the graphics MacKenzie designed for this, a departure from the often text-heavy, table-style graphic organizers we see. (yes, a couple are table-like, but visually appealing) This review is a synopsis of the book, with my personal thoughts in italics. A key point is that “relationships (come) first”, making that connection with all students. Needless to say, this builds the trust necessary to take risks and dig deeper. In the early days of the school year MacKenzie works with his students to develop the curriculum for the course. I don’t think the suggestion is to have students build the course, but be more empowered to choose approaches to learning (ie) activities, and content, such as readings or videos that might be used. Some curriculums offer far more flexibility than others. A student survey (Google Form, perhaps?) similar to a learning survey that you would connect to visible learning models. See p.14-15. Students present their course design and explain the what and why behind their thinking. Discussion leads to a public document or poster for reference. He adds this list to the course syllabus, and shares their thoughts with faculty in an effort to get their collective voice “out there” to an authentic audience. The graphic designed by MacKenzie explains it all, but here is a synopsis, which is also chronological. It makes sense to me that this order would foster greatest success. Students who have experience with IBL can be a valuable resource in helping others understand the process and strategies. Structured inquiry - The teacher provides the essential question, the resources and activities. Students deepen their understanding of how to create an essential question, choose good resources, conduct research, create learning evidence, and create a learning artefact. But the teacher has control and does a lot of leading. Controlled inquiry - Several essential questions are provided for students to tackle. There is a greater variety of resources, but students complete a common task. More choice is given, but the teacher still has greater control over the learning. Guided inquiry - The teacher provides the essential question, or a small set of questions, and students seek their own resources to complete research and choose their own method of demonstrating learning. You can see this gives the learner a greater amount of autonomy. Free inquiry - This is the deepest level, where the student is free to construct the essential question (or questions? ), determine what resources will satisfy quality task completion, “customize” evidence of learning through a performance task they determine. This would clearly take a lot of conference time, as students need to be supported in their learning. MacKenzie looks at free inquiry more closely, acknowledging the process that gets them there. (explained above) This stage requires a lot of planning and front loading by the teacher to ensure that there is some guidance so that students can be successful. He lays out a 7-step process he’s developed (and uses; see the graphic on p.42). 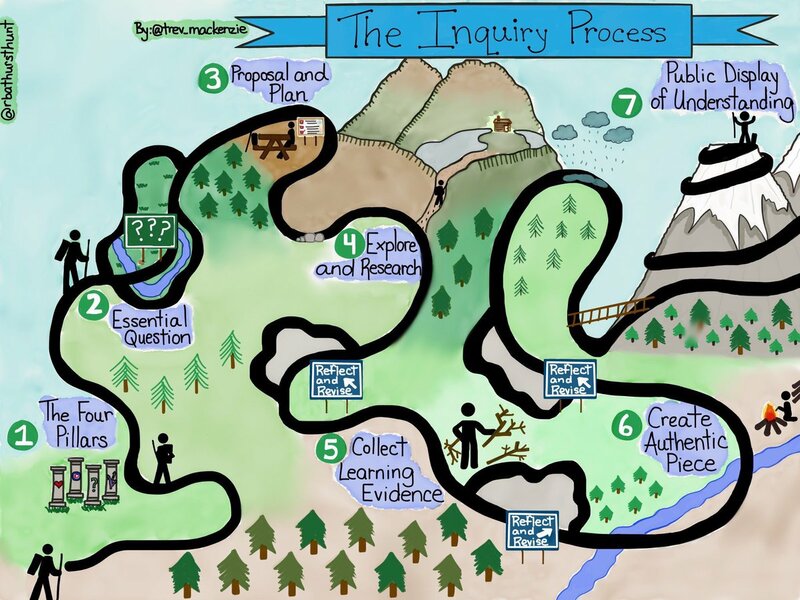 We’ve seen a variety of iterations of the inquiry process. The rest of the book outlines this 7-step process, which I’ll very briefly summarize below. 1. The Four Pillars of Inquiry. He furthers this by showing videos of young people explaining their passions in some way, such as Caine’s Arcade. (ii) “Aim for a Goal.” In this pilar students have to think about their future. What is it they aspire to be, or in the least, learn more about? The have to think about how to do this, such as read through resources, conduct interviews, or job shadow. The teacher interviews students. MacKenzie gives a list of questions he asks (p.55-56). The interviews help inform how the Free Inquiry unit is approached. (see Eli from p.56) In my current situation this would be quite difficult - not a cop-out, but a reality. Easily done for an elementary teacher, but even finding time in the first month outside of class to meet each of my 80 students would be tough due to their schedules and bus times. An online Google Form would work, but be impersonal and not allow for the one-to-one contact and asking the inevitable questions that arise. I’m thinking to start with only my Grade 8s - 46 students, and in SEM 2. (iv) And finally, the pillar “Take On a New Challenge” is all about a personal challenge. It can be local or global in nature. It can have an end-goal of self-improvement or one for the community. MacKenzie begins with group challenges. He facilities small-group challenges with a variety of activities based on his passion for educational technology, such as Breakout EDU, makerspace challenges, or 3-D design. (check out Tinkercad) Realizing that students want to do good deeds and have an impact on others, he also provides long term group challenges. (see p.67 for a description of a literacy project his students undertook) Another example can be seen by a student Ethan, who really dug deep for his Free Inquiry, a challenging project he continued into post-graduation. An important key to this example is how the teacher was flexible in the students learning, and how he leveraged technology to see that the student, Ethan, could succeed in his project. Very cool indeed. 3. Create Your Free Inquiry Proposal. The idea here is to use backward design to guide students in the next stages of the process, with another kid-friendly (and teacher-friendly) graphic on p.81. It begins with a close connection to the last section, creating an essential question. (i) The student sells the idea to the teacher, demonstrating why it is intrinsically motivating. In my experience, not only the question but the resources also change as the inquiry goes on - this is natural. (ii) The student determines what method they will use to demonstrate their learning - the “authentic piece”. MacKenzie points out that a digital element doesn’t disappear easily. I’ll add that digital material is easy to share with the world, making the audience wider and truly authentic. (iii) Students identify the resources they will use for success, and (iv) identify goals for the inquiry. (v) Students identify how they will document the learning process - the evidence, and (vi) create a plan. (see p.87-88 for a sample plan with modifications) All of the above leads into a consideration for time frame and a meeting with the teacher - the “pitch”. See the example on p.90. Another crucial point made is that the Free Inquiry must meet course requirements, and include proof that they have. MacKenzie gives examples of the “authentic piece” on p.92, basically presentation styles students may choose to attempt. Students must also plan to publicly display their work in some form - read more below. 4. Begin to Explore and Research & Collect Learning Evidence. This is a straightforward step in the Free Inquiry process, but MacKenzie brings a reminder of methods to reduce student anxiety. (let’s face it - it’s a big project) See what his students’ experiences are with using an inquiry journal and periodic check-ins, from p.97. He also clearly appreciates the value of our school media-library specialists. 5. Create Your Authentic Piece. This should be a piece that demonstrates understanding of the essential question, what the student has learned, and ideally inspire and interest others. Using backwards design to plan the piece will help students with the process, and include a connection to course objectives. (again, a critical part of the process) Something that strengthens the process is self-assessment. MacKenzie goes through the steps the teacher and student can follow together in developing a self-assessment rubric that satisfies course requirements and maintains student motivation. This includes a consideration of consultation with professionals outside the school. (p.105-107) The following section gives ideas for refining the piece and developing it in a way that is engaging for the audience AND the student. See the examples on P.110-111. 6. Public Display of Understanding. The is the culmination of the course and the Free Inquiry project. MacKenzie gives suggestions for how students (and the teacher) can display their work in such a way that it reaches the school community, and potentially beyond. In general, he refers to an Inquiry Open House, with “inquiry stations”, and the forms it can take. (p.114-117) It includes students taking viewers along their learning journey from the start of the essential question to an inquiry statement - why they chose their topic. They create a reflection that goes on a class YouTube channel with a QR code in the gallery - a great idea. Moreover, MacKenzie also has a strategy for having extremely shy students to publicly display in comfortable setting. The “Public Display of Understanding” is a critical piece of the puzzle for myself. I have suggested holding a “Social Studies Fair” in the past, but to no avail. School calendars are packed, though I truly believe such a project can be flexible and not disrupt a school calendar, and Trevor MacKenzie reinforces this with the suggestions made in “Dive Into Inquiry”. Perhaps I have to work on my own sales pitch. California: EdTechTeam Press, 2016. Print. speaking, engaged listening, deep thinking. Alexandria, Virginia, USA: ASCD, 2015.
questioning. Alexandria, Virginia: ASCD, 2016. Print. Updated to include a new graphic from the book - the Inquiry Proposal. It's hard to really step back and reflect on where you as a teacher are pitching classes, but also where they are coming from. Which stage were the children at last year? Is it easy enough to continue into the following year or should we restart the stages again each time? As I mentioned in my post I think that it's important to use teacher discretion and personalise the learning. Not all children need to be at the same stage at the same time. I agree 100%. Enjoyed reading your reflection lee!